I often think that building a house is similar to the birth of a child. The conception is the time when my clients dream about what type of house they would love to have. They look at websites and read books or magazines to gather as many ideas as possible that fit with their imagination and values. Then there is the gestation period – the drawings phase – where I work with my clients to get their ideas and dreams down on paper and fleshed out. Then comes the actual birth, starting with the foundation and getting the house out of the ground. From there it’s like the child that grows up. Different phases continue on the house, the walls get built and the roof goes on. Then the building continues to grow with the addition of decks and siding and the windows getting put in. It keeps growing, with kitchens and bathrooms, flooring and trim, paint or plaster, until it is fully grown and the move-in date has arrived. And just like raising a child, it’s a lot of hard work with many hard decisions, and a big investment of resources. In the end, all of that hard work pays off and my clients get to enjoy the fruits of their efforts! And the best part is, every house that I build is just like a child, unique in it’s own special way. 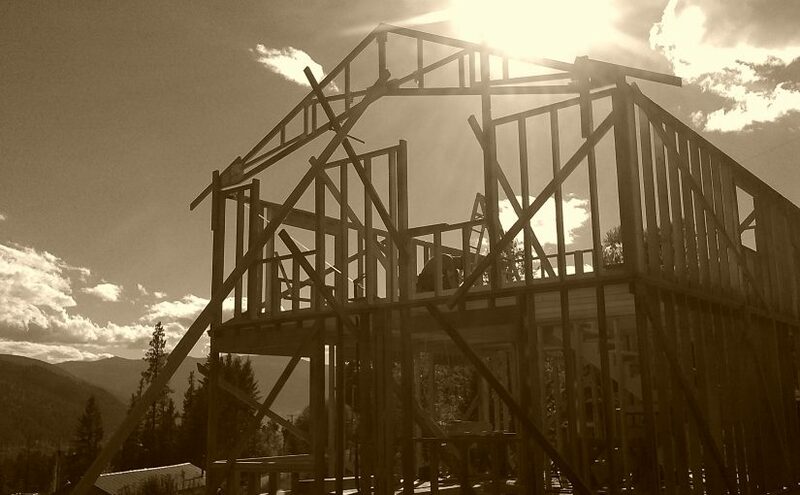 This photo shows the framing being done on a straw bale house near 6 Mile, just outside Nelson, BC.